Sometimes a planner wishes to share the planning status of a particular material with colleagues or partners that are not SAP users. In this case it is useful to export the planning overview to Excel and perhaps pimp the lay-out with some colorful headers. To do this -from within MD04 or MD07- go to Menu > List > Variable Print. Immediately a new overview opens up that may look less attractive than the overview you are used to. 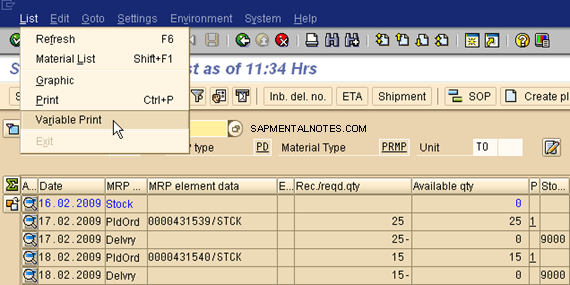 On the screen ‘Print list – variable’ you can change the lay-out and save it as a variant like you are used to in standard SAP reporting. To get the best Excel results export the report directly to an Excel table, as opposed to first store it as a local file and then open it in Excel. This way the lay-out is optimized for direct filtering and sorting. This is all there is to it. Sometimes SAP life is that easy. This entry was posted in MM, PP and tagged MM, MRP, PP, Tools on February 16, 2009 by mensenjh. There is always something to be learn. 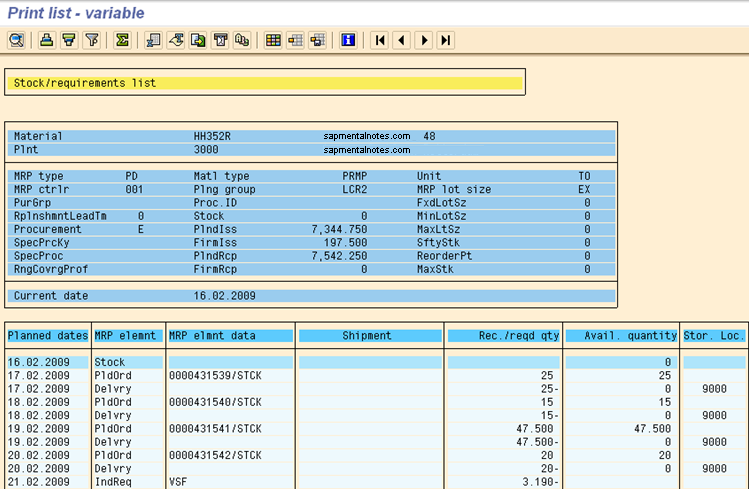 Many thanks for the tip to transfer MD04 to excel and to print. I want to have a “background” job export/printer/whatever directly into an excel file. I want to have a “periodic” job (in this case, weekly), to generate the results in an excel file, rather than “.pdf”, or an email. Specifically, I wish to run t-code “cooispi”. The variants and other good stuff are irrelevant.